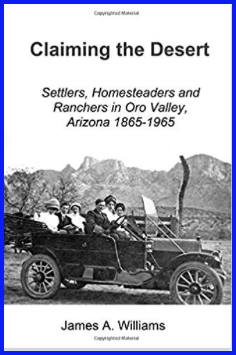 From time to time, LOVE is featuring Oro Valley author Jim Williams and his book Claiming the Desert: Settlers, Homesteaders and Ranchers in Oro Valley, Arizona, 1865-1965. This is an excerpt from his book. Individuals from Tucson and other locales claimed homesteads in four townships that roughly correspond to the Town of Oro Valley today. These grantees were a group of hardy pioneers who braved many difficulties. Everyday life was challenging. Some of them prospered, but not all. Homesteaders came to this area from a variety of locales. Some came to Tucson via the Southern Pacific Railroad. Train travel was preferred because the highways in Arizona and neighboring states were barely functional for interstate travel before the late 1940s. Gene Magee, who owned a homestead in what became Oro Valley, remembered traveling three days by rail from Oklahoma to reach Tucson. Most homesteaders already lived in Tucson for some years before applying for a homestead. After arriving in Tucson, homesteaders traveled by wagon or automobile to their claim. Buster Bailey, a resident from 1927 onward, remembered that the Oracle Road “was always rough,” consisting of unpaved highway with some gravel. Robert Wilson visited his father Lawrence Wilson’s homestead near Oracle Road in the Thirties and remembered a rough road of packed dirt. Orange Grove Road and La Cholla Boulevard were established by 1930, both county roads but in worse condition than Oracle Road (then called the Tucson-Florence Highway). Maps of the period 1900-1940 indicate many other unnamed and virtually unimproved roads in the area. The difficult roads presented significant problems for homesteaders. When the Jim Reidy homestead dwelling was under construction, he and several laborers finished work on the building for the day and started back to Tucson in his 1928 Chevrolet. A flash flood hit as they crossed the Cañada del Oro, and one worker was swept away. He was later found one-half mile downstream, clinging to a Palo Verde tree. The Chevy was destroyed by the flood. Betty Chester Dreyfuss, who lived in what is now Catalina State Park, recalled that her family was isolated when the Cañada del Oro flooded. For days, food and other supplies had to be brought in via a cable strung between two poles on opposite sides of the wash.
"Claiming the Desert" is available at the Western National Parks Association and through Amazon.com.